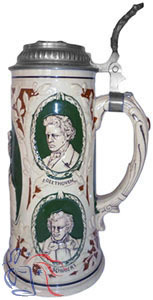 The central decoration on this stein portrays Richard Wagner (1813-1883), the acknowledged master of German opera and one of the most progressive composers in history. His monumental cycle of four musical dramas, collectively entitled “Der Ring des Nibelungen” (The Ring of the Nibelungs), took 22 years to complete, and stands as one of the most remarkable and influential achievements in Western music. 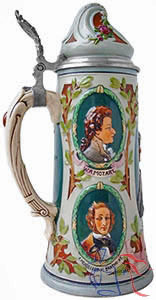 Side images depict Beethoven, Mozart, Schubert and Mendelssohn.